I have the most hectic part of school year going on right now (one hard exam coming up next week and lots of group work tasks to do). I'm going to post the new rounds of my games next week so if you still haven't replied or want to do some changes to your replies, you can still do that. Last round's answers were Pomekichi from All Out!!. The answer to the bonus question was Etsugo Oharano. 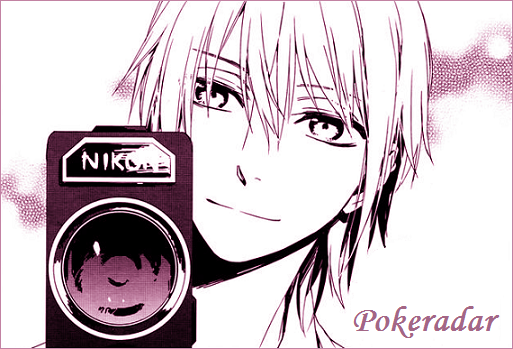 Ah, what a good day to meet you here~ ♥ My name is Tatara Totsuka but you can call me either way you want~ I really like making memories by using my camera but after taking lots of pictures of my friends in Homra, some of them are getting more and more annoyed by it. ^^' So I started to think that how it would work with animals. Could it be possible to create memories with them as well? At first it was a bit hard because some of the animals are really shy or they don't want to come out at all. That's why I had to be really careful with them because I didn't want to distress those beautiful creatures. An intelligent corgi who is also called as "data dog". Can you help me by telling me his name and the series he comes from. As a prize for your help, I'll give you three random cards. Bonus: If you can also tell me the name of his human friend, you'll get one additional card and a crayon. This whole week has been extremely busy with new exchange students so I'll post the new rounds of Costume Party and Guess the Color next week (as well as Pokeradar on Sunday, I completely forgot it last week with all these tutor stuff). orz So if you haven't replied to those games yet, you can do still do it. The most hectic part should be over now since I don't have new exchange students coming for a while and I'll have only two days of school next week. Last round's answers were Su from One Piece. A family dog who gets tired easily while taking walks. Can you help me by telling me his name and the series he comes from. As a prize for your help, I'll give you three random cards. Bonus: If you can also tell me the name of his owner, you'll get one additional card and a crayon. Mod's note: Because of the delay, you'll get one additional card after this round ends. Last round's answers were Puck from Re:Zero kara Hajimeru Isekai Seikatsu. An intelligent pet who is a cloud fox. Can you help me by telling me it's name and the series it comes from. As a prize for your help, I'll give you three random cards. The current rounds of Pokeradar and Costume Party are open till next Thursday (May 12th). Last round's answers were Karupin from Prince of Tennis. A cat familiar who works from 9AM to 5PM. Can you help me by telling me it's name and the series it comes from. As a prize for your help, I'll give you three random cards. Last round's answers were Winnie from Free! Eternal Summer. A cat who is looking for his toy which his owner accidentally took with him to school. Can you help me by telling me his name and the series he comes from. As a prize for your help, I'll give you three random cards. Last round's answers were Ao (whose owner is Shin-Ah) from Akatsuki no Yona. A friendly little dog whose owners are from Australia. Can you help me by telling me his name and the series he comes from. As a prize for your help, I'll give you three random cards. Last round's answer was Wiz/With from D.N.Angel. Can you help me by telling me his name and the series he comes from. As a prize for your help, I'll give you three random cards. If you can also tell me the name of it's owner, you'll also get one additional card and a crayon after this round ends. Because of the delay, you'll get one additional card after this round ends. Last round's answer was Gomamon from Digimon. Somehow this little guy had sneaked inside one of my friend's apartment. He didn't seem to be afraid seeing us so I wanted to take a picture for help finding someone who might know him. I didn't get much details about him but it looks like he really likes eating strawberries. Can you help me by telling me his name and the series he comes from. As a prize for your help, I'll give you three random cards. Last round's answer were Yakul and Ashitaka from Princess Mononoke. This little guy was trespassing earlier this week. It was a bit surprising because he was knocking one of our windows. He was very talkative but didn't stay long before he had to leave again. I wonder where he was going. Can you help me by telling me his name and the series he comes from. As a prize for your help, I'll give you three random cards. Last round's answer was Onigawara (Hellbrick) from Sacred Seven. This elk was wandering around near the forest some other day. At first I thought it was just an ordinary wild elk but then I noticed the saddle and rein. He also wasn't alone but there was a young looking boy with him. They seemed a bit scared of me so I didn't want to interrupt them for too long. Can you help me by telling me the names of the elk and the boy and the movie these two come from. As a prize for your help, I'll give you four random cards and a crayon (five cards in total). Last round's answer was Yukine from Noragami. I have to say that this stone-looking creature seems very interesting, don't you think? I didn't get much information about him but I hope these small details will help you out to tell me his name and origin. He was able to talk and he kept repeating this one word every time he quit a sentence. Could it be it's part of his name? Can you help me by telling me his name and the series he comes from. As a prize for your help, I'll give you three random cards. I'm terribly sorry about the trouble with the last round. I didn't realize there isn't much information about the series and especially the character yet. orz That's why I decided to give a random crayon for everyone who tried to guess the character's name. Last round's answer was Righty-chan / Migite-chan from Bubuki Buranki. I'm pretty curious about this cute little guy. He looks like a snowball to me but watching that sad-looking face you can't be mistaken, right? I wonder is he some kind of spirit, maybe? Can you help me by telling me it's name and the series it comes from. As a prize for your help, I'll give you three random cards. This round will end on February 23rd. Last round's answer was Nico from Earl and Fairy/Hakushaku to Yousei. This one looks really interesting. It looks like a right hand but I'm pretty sure there is something else behind it too. I get to know that creatures like these are used as "tools", they can fight and protect their "masters" if some bad guys would attack. I think it must be very strong then. Can you help me by telling me it's name and the series it comes from. As a prize for your help, I'll give you three random cards. Last round's answer was Byakkomaru from Owari no Seraph. Um, hello, I'm Eric Sōlt. I was asked to do this thing because Totsuka-san hasn't been feeling well this week. He wanted me to ask for help to recognize a cat. This photo was found earlier this week, I think it was taken last Summer. Totsuka-san said that the most fascinating thing was that the cat kept repeating how he is not a cat. Sounds weird, doesn't it? In addition to that he was able to talk, he could walk only with two feet. Can you help Totsuka-san by telling me his name and the series he comes from. As a prize for your help, I'll give you three random cards. Last round's answers were Azusa and Tsubaki from Brothers Conflict. The answer to the bonus question was Natsume Asahina. I was super lucky to get this picture. It took only couple of seconds and then the tiger was gone. There was this one guy with a big scary-looking gun and after yelling something, the tiger came out of the gun. To be honest, I'm a bit curious about how is that possible. ^_^' And what were those vampires they were talking about? Hmm. Can you help me by telling me what is the tiger's name and the series it comes from. As a prize for your help, I'll give you three random cards. Last round's answer was Toboe from Wolf's Rain. I wonder why these two are so angry. Maybe they are hungry? The catswere hanging out near my home, though I didn't get a chance to give them food or anything else because they were behind this glass window. Can you help me by telling me what are their names and the series they comes from. As a prize for your help, I'll give you three random cards. If you can also tell me the name of their owner, I'll give you one additional card and a crayon. I'm leaving for a con very soon so the current rounds of Pokeradar (Tuesday), Costume Party (Thursday) and Go Fish! (I'm starting to post this game as biweekly starting from Saturday January 23rd)) are open till next week. I apologize any inconveniences this might cause. I'll reward my older rounds immediately after returning home on Sunday.